AVS Audio Converter can convert between most known audio files: WAV, OGG Vorbis, MP3, MP2, Microsoft ADPCM, WMA, VOX, AAC, M4A, AMR and other well-known media formats according to your wish.With the support of multi-core processor, the conversion time is almost halved. This software can specify frequency, number of channels, bitrate and other parameters of output files before conversion. It can apply Fine Tuning of Parameters. ...... of output files before conversion. *Convert, edit, create ringtones, enjoy audio conversion process. 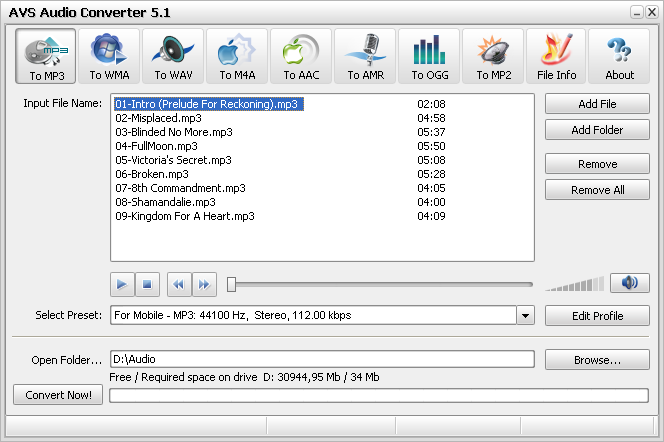 Convert audio files between MP3, OGG, FLAC, APE, AAC, M4A/M4R/M4B, AMR, WAV, MIDI, KAR and other formats with AVS Audio Converter. *Use batch mode to convert and work with several files at one go. *Edit audio before conversion. Trim, merge, cut audio files. *Convert your audio data to M4B format, divide them into chapters and make ready for your iPhone or iPod. *Add your own information to audio files (titles, authors, comments). Qweas is providing links to AVS Audio Converter 6.3.1.468 as a courtesy, and makes no representations regarding AVS Audio Converter or any other applications or any information related thereto. Any questions, complaints or claims regarding this application AVS Audio Converter 6.3.1.468 must be directed to the appropriate software vendor. You may click the publisher link of AVS Audio Converter on the top of this page to get more details about the vendor.